Topps is already thinking ahead to 2012's baseball release. On August 18, 2011 Topps tweeted a sneak peek of what to expect when it comes to its 2012 baseball set. Click here to see the tweet. The new design announcement comes on the heels of the 2011 Topps Baseball Factory Set release, which was July 20. It's safe to say that Topps wasted no time giving us a taste of great things to come. 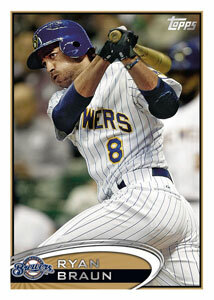 Pictured to the left is Ryan Braun in an example released by Topps to show the design of the 2012 release. Similar to the previous year's release, the white border returns along with a circular style to the bottom that contains the name and logo. While this is not a huge departure from the recent past, Topps new design looks clean and it feels like the player name and team logo are more accentuated and easier to read. Along with cards from the base set, whose design is pictured above, there will be plenty of inserts and autographs to chase. Topps has said the inserts will include: Autographed Gold Coin Cards, Epic Walkoffs, Golden Greats, Golden Moments Cut Signatures, Golden Moments, Gold Standard, Gold Futures, Generations Duals, and World Champions. Hopefully you can see the theme here.....GOLD! And so far it looks like Topps is on it's way to give us a golden 2012. Check out Dean's Cards for all your Topps Baseball Card needs. Whether you're into buying Topps Baseball Cards, Topps Football Cards, or trying to complete that 2011 Topps Baseball Set, DeansCards.com has an extensive offering of Topps Singles, Sets, and Insert Cards.